Bamboo Villa on St. Martin’s French side is a private home featuring 2 bedrooms, 2.5 bathrooms, and much more. The kitchen is yours for preparing snacks and meals, and these can be enjoyed inside or out on the covered terrace. A large living area is the perfect place to unwind in the evening, or take it outside on the patio lounge chairs and enjoy the view of the Caribbean Sea and surrounding tropical plants. A huge pool is great for day or night swims, and guests can take easy trips into town for supplies or shopping, or head to the beach that is just a 3-minute drive away. Great for 2 couples, honeymooners or a small family! 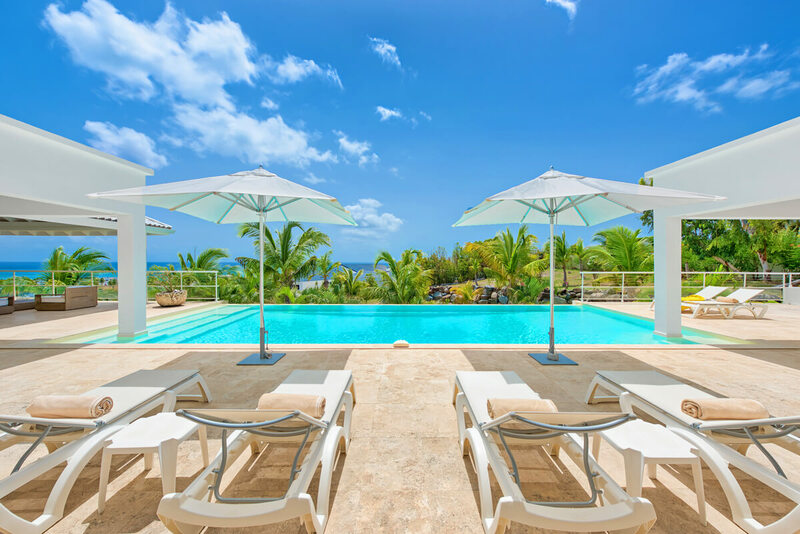 Bamboo Villa is just a 3-minute drive from Baie Longue Beach, overlooking the waters of the Caribbean Sea and setting on striking landscaped grounds. This modern hillside villa is the ideal place for those looking for leisure and convenience as it is located just minutes away from dining and night life. The open layout makes this new two-bedroom villa unique. The contemporary and comfortable living room features a plasma TV, DVD, Satellite, CD/Tape, and ceiling fan. The two bedrooms have king-size beds, large private shower baths with dressing areas, plasma TV & DVD, air-conditioning, and ceiling fans. We do not guarantee the internet connection. The owners or Wheretostay.com cannot be held responsible if it is not working properly. In case the wireless connection is not working, a dial up connection for $95 for 50 hours connection can be provided. To Beach: 3 min. drive Long Bay. No air-airconditioning in living room. 2 bedrooms and kitchen are not accessed from living room. In other words, the house is not really a house. Once you walk thru the living room you are outside which is how you access the kitchen and the bedrooms. Horrible. This is not a house for families with children at all and when I want to get something from the kitchen, I do not want to be outside, but rather I prefer to be inside a locked home. The kitchen is completely open to the air. There is no way to keeps the bugs out. The sliding door to close off the living room was impossible to close. There was no secure feeling in this house at all. There was no tubber wear or foil to preserve food provided. Some spices for cooking would have been nice.The pool had no shaded areas no umbrellas are provided. No shampoo or conditioner, candles (in case of black out) citronella candles for the bugs, or a flash light were on the property. There was not an umbrella for the rain either. Some of the furniture was old or broken and needed replacing.The chase lounges were old wooden ones that weighed a ton and were not on wheels. My pillow was stained beyond belief. Only one set of front door keys were provided and yet there were three guests.The chairs for the beach were old, heavy and rusted. Only one tiny beach umbrella was provided and I had to call to request a cooler. The house has two large windows in the living room, one of which has nothing on the other side of it to deter birds from hitting it. One day while in the kitchen, I heard a crash and there lie a dead white fairly large bird of pigeon size. It was very disturbing, but I disposed of the bird in the garden. I thought that that was a one in a million incident and moved on. Two days later while on the lounge chair with my back to the window, I hear yet another crash and as I run into the living room, I witness, this time, a much larger bird with a great wing span repeatedly crashing his head into the glass trying to escape. I took the magazine that I had in my hand and gently moved it from the side of him in a circle towards his face in order to have hime turn around. Thank god, he seemed to understand and he turned a flew out. I cannot believe that this does not happen all of the time at this residence and this situation disgusted me to no end. This house needs a solar shade on this window to prevent these innocent birds from hurting or killing themselves. I have stayed in many villas, and this villa and its lack of thoughtfulness did not meet my expectations by any means. On my last day, the maid came at 10am and proceeded to start cleaning the kitchen and slamming things around as we were sitting there having breakfast. Check out is at 12pm so she should not have been there before. I have stayed in many villas on St Maarten and this is my least favorite and I do not recommend for anyone. Easy enough to work with, however, he and I have different expectations as he is very impressed with this property. Perhaps just glancing at it does not provide you with the true feeling of staying there.